So it’s been months since I’ve bought this little beauty at the L.A. Pen Show. 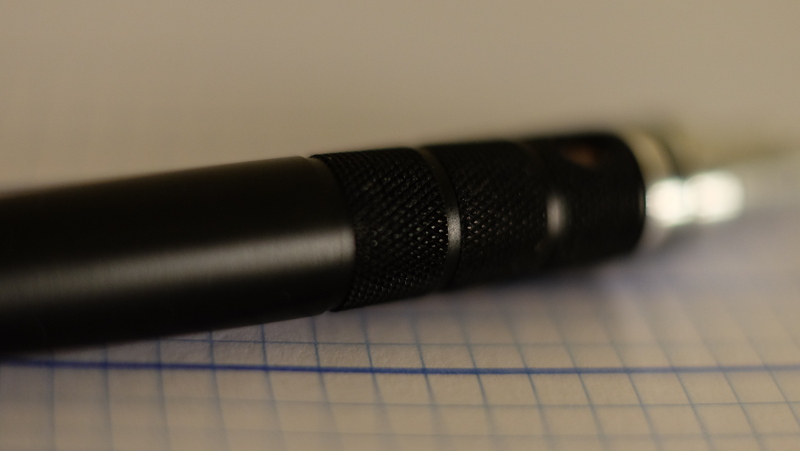 It was one of the pens that was on my “definitely buy” list along with my Franklin-Christoph Model 40P. I was never initially drawn towards Edison pens. I don’t remember the exact reason, but I was much more enthusiastic about Japanese fountain pens. This particular model, the Pearlette was a complete mystery to me until I read a review from The Gentleman Stationer. WARNING: Word and photo heavy post. You have been warned. When I was at the L. A. Pen show back in February, I was absolutely thrilled to purchase my first pen from Classic Fountain Pens (nibs.com). I was wide awake, unable to sleep, wondering which pen to get. I was still in my developmental stage as a pen addict, so I was looking for a different experience. When I say different, I meant a smaller nib size, as I had gotten too used to my binderized VP medium nib. After my jaw hit the floor when looking at the price tags on the Sailor pens, I looked into offerings from Platinum. At the time, the Nice Pur was the latest edition in the #3776 Century models. It was a variation on the Nice, which was the previous iteration. I was briefly attracted to the Nice, but the rose gold plating made it seem a bit too gaudy for my taste. I just couldn’t bring myself to get a pen with gold hardware. When I was testing the nibs, I was asking advice from John Mottishaw. I told him about my medium VP that I adored, as well as the Franklin-Christoph Masuyama medium CI I had bought that same day. My request was to recommend a nib that gave me an entirely different writing experience from the pens I already had, but was smooth at the same time. He handed me a Platinum fine nib and told me to test it out. I put the pen to the Rhodia pad and it glided across, but provided a decent amount of feedback. I asked to try the medium next, and after a couple of scribbles, decided that it felt too similar to my VP. I narrowed it down to the broad and fine. After mulling it over for nearly 40 minutes, pacing back and forth, I went with the fine. As John was optimizing the pen for me, I was giddy with excitement to test it out and review it. I thanked him for his patience and went on my way. Fast forward a few months, the Platinum was lying inked up, yet unused in my desk drawer. How did this situation come about? Right after going home, I inked it up and put it into my note taking rotation. I was taking my first class in Spring quarter, and was eager to put this baby to use. I started writing and stopped abruptly. The smoothness had completely gone, leaving it scratchy as a nail. I thought it may have been a problem form the factory, so I went home, rinsed it out, flushed completely, and inked it up again. Same problem, and all the inks I had at the time made this pen seem dry and scratchy. Disappointed, I put it in my desk drawer and forgot about it. After nearly 7 months of lying in my drawer, I finally spotted it during my pre-Fall quarter stationary inventory. The painful memory of it’s scratchiness surfaced, and it almost went back in. However, in a split second decision, I decided that I had to at least review it for my blog. I uncapped it and tried writing, lo and behold, it worked perfectly without any hard starts. The Slip and Seal mechanism that Platinum heavily advertises as one of this pen’s features really isn’t just marketing hype. After 7 months, it worked the moment the nib touched the paper. Any bad experience I had with this pen had to be let go, to be able to review it and form an unbiased opinion. So I flushed it and inked it up with a new ink I had bought, Sailor Souten. When trying it out again, I was reminded of the buttery smooth dream nib I had tested way back when. Mystified, I tested it with my standard Iroshizuku Kon-Peki, resulting in it being smoother than the Souten. It was at that moment I realized how stupid I had been. The performance of a pen can be affected depending on the ink inside. I had completely forgotten about this, which resulted in me ignoring one of the best pens I’ve ever purchased. I was never one for demonstrators, as I felt they looked cheap due to the plastic. The aesthetic of this pen completely rejects that supposition. The striated frosted plastic looks absolutely gorgeous. My only complaint is that the lines tend to dig into my skin when I try to twist the cap on and off. Other than that, it’s one of the best looking pens I’ve had the pleasure of using. The first 2000 pens are engraved with a number, as you can see above. Mine is #1597. The engraving is very minimal and I didn’t even notice it until I checked. It’s also very hard to capture a photo of it, as the slightest amount of glare tends to reflect off the top. No matter how hard you try to keep the nib free from ink, it’s near impossible. Unless it’s uninked, I have yet to see a Platinum #3776 not have small specks of ink all around the slit. I initially wanted to gripe about it, but realized that it’s not too big of a deal. The clip is one of the tightest I’ve ever used. When I’m sliding it into my pencil case, I have to put a bit of effort and bend the clip upwards, otherwise, it’s impossible to force it in. It has kept it’s shape and tightness pretty well over the last month. I feel reassured that it won’t slip regardless of whether you’re wearing it in your shirt/pant pocket, or a pencil case. 1 year and 2 months. That’s how long I have been using this pencil. I purchased it a little while after my blog was started, and it’s been in review limbo since. I had written up a review almost 7 months ago, but I never clicked publish. After all this time, I feel this pencil should get justice for all the time it waited. So let me start off by saying this: This is hands-down the best mechanical pencil I have ever used. My assertion may seem premature, as I’ve not put up any mechanical pencil reviews till now. Allow me to assure you that going through middle and high school, I’ve extensively used a myriad of different mechanical pencils. From the cheap BIC pencils to the obscenely expensive thin alpha gels. After all this time, and swapping of writing instruments, I have finally found “the one”. What makes this the best pencil I’ve ever used? Simple. The lead rotation mechanism. It was the very first thing that caught my eye with this pencil. Now when I was extolling the virtues of this pencil to my friends, they had a rather doubtful look on their faces. Is that feature really necessary? It shouldn’t matter that much right? These are the questions I usually got from them. 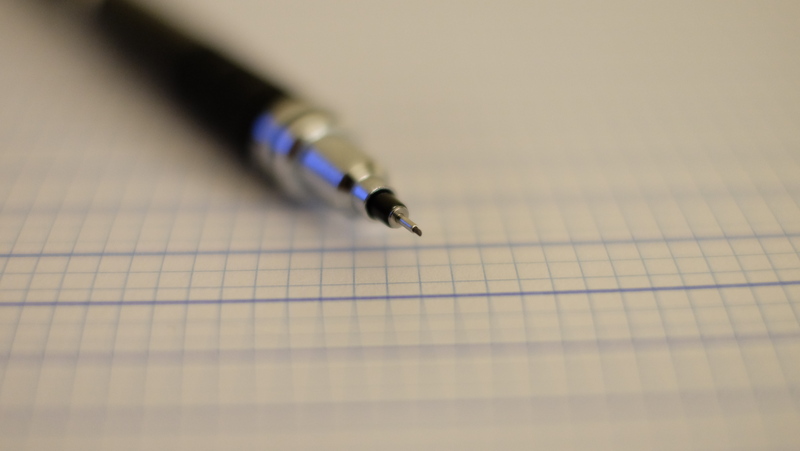 When you’re writing with a pencil, you are wearing down the lead by depositing it on the paper you’re writing on. A problem I faced with a lot of the pens I previously used, was I would keep favoring one side of the lead, resulting in a sharp peak on the opposite end. This problem could be solved one of two ways. 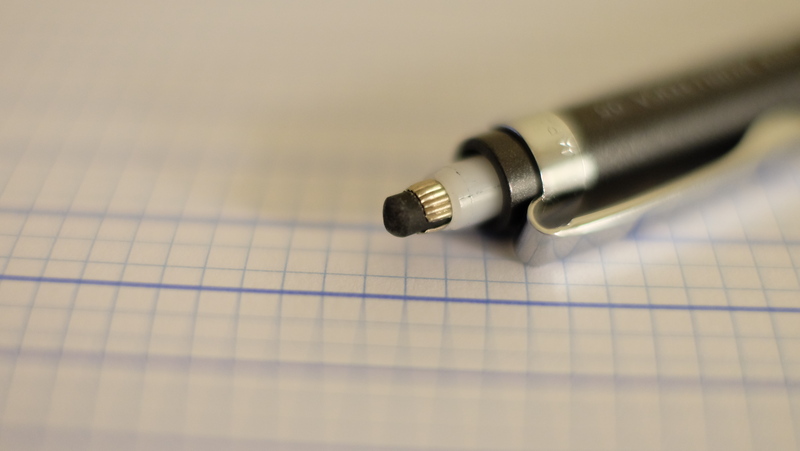 Flip the pencil over and write with the opposite end, or break the tip and restart on a fresh section of the lead. Both of these methods tended to cause inconsistencies in my writing. By choosing the first way, the lead would sharp and unforgiving, degrade the lead faster and result in darker letters. The second way would cause my writing to falter when dealing with the circular part of the lead which had yet to be broken in. This pen fixes the problem as advertised, by rotating the lead and evening the surface out for consistent lettering. Now all of you know by now how much of a stickler I am for grips that perform well. I find a problem with the simplest of things and have very precise standards I measure by. 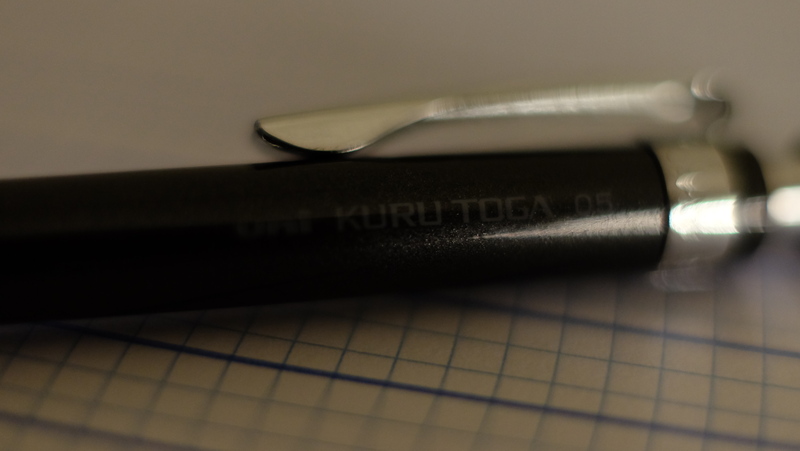 The knurled grip section of the Kuru-Toga has just the right amount of sharpness to it. While not biting into the hand, it’s definitely noticeable. I feel it does a really good job, as my grip has never slipped when using this pencil. The eraser is about the size of a Tic-Tac, and it will definitely not last very long. I would recommend buying a separate eraser when purchasing this pencil. I restrict the usage of the eraser, and only use it in case I absolutely have to. There are two versions of the Kuru Toga Roullete. The base model, and the expensive model. I personally opted for the expensive model, as I prefer pens with a little bit of heft. The more expensive version makes use of more metal components, that also add quality and longevity to the pencil. In my case, it’s seen heavy usage almost everyday for the past one year and two months. It has become my go-to pencil for use in any situation, be it note taking, test taking, general doodling, journaling etc. It has yet to present any problems, and I don’t see any in the near future. I have accidentally dropped it dozens of times on all sorts of surfaces, yet the finish looks the same as the day I pulled it out of the box. All in all, this is one tough pencil. I don’t see myself buying another pencil for a long time.